– 1960 – Mali achieves independence. Its first president, Modibo Keita was a fervent promoter of African unity in the early post-colonial period (1960s), but the divergent view of how African unity might proceed kept him from realizing his goal of an economically, socially and politically more unified continent. – French military presence in Mali has a long, uneven history. After independence, under Keita’s leadership, French military bases in the country were closed. – In November, 1968 Keita was overthrown by a military coup led by General Moussa Traoré – with the support of France. Traoré instituted a harsh military dictatorship which prohibited all democratic expression and opposition. – 1985 – Traoré signs a military cooperation agreement with Paris; but with clauses that limited both the size and scope the French military presence. – 1991 – popular demonstrations grow – at one, the army fires on demonstrators killing 300. By the end of the year Traoré is overthrown by the military supported by many elements of the population. – 1992 – a civilian, Alpha Oumar Konaré. Konaré is the only Malian president to retire (without being overthrown by a coup) after two terms in office in 2002. – 1992 – a national pact between the Malian government in Bamako and the coordinating committee of Tuareg (Azawad) rebels is signed. France, as in Rwanda – sends a contingent of DAMI (Détachement d’assistance militaire) to Mali. – although he publicly stated that he would be willing to step down after two terms. Unfortunately, his regime was also characterized by extensive corruption with those close to power centers implicated. His rule was also characterized by a history of intimidation and repression of journalists and trade union leaders. – his 2007 re-election campaign was marked by extensive election fraud, and the result – that he had achieved some 71.20% of the vote was viewed with no small amount of cynicism. – finally the economic situation in the country was terrible. Mali remained one of the world’s poorest countries, eroded by endemic corruption and incapable of providing even the most basic human services in spite of mineral wealth which made Mali one of the principle gold-producers of the region. – in the end, Touré had ruled Mali as a French puppet since 2002 and had previously been accused of drug dealing with war lords. – 2007 – US military “assists” the Malian army in countering a Tuareg revolt led by Ag Bahanga. – 2010 – French hostages seized. France forms a 250 man Malian special forces unit; France asks Mali for “temporary” base rights to fight Islamic terrorism; fearing Islamic retaliation, Amadou Tourmani Touré refuses. As a result,. French special forces are beefed up in Niamey, Niger. – Amadou Tourmani Touré’s refusal to permit a French military presence is probably a key element in France’s lack of response to his being overthrown in a military coup. France did nothing to prevent it. – 2012 – the MNLA (Azawad National Liberation Movement) wages war against the central government. Government engages in a half-hearted effort to stem the northern rebellion which grows in scope. It is also a failure for the U.S. military who had trained the Malian military for just such a possibility. Despite the training, Malian soldiers were poorly trained and badly equipped, with many having gone hungry. – March, 2012 – generals of Mali’s military (green berets) overthrew Amadou Tourmani Touré, inaugurating the National Committee for the Restoration of Democracy and State. The coup was led by Captain Amadou Aya Sanago, who had received six training military missions in the United States. The military led coup was supported by a mass, popular movement called the March 22 Movement led by left-wing deputy Dr. Oumar Mariko.– Many supporters of the coup had demonstrated in support of Muammar Khadaffi during the Libyan War of 2011; they wanted a strong Malian state to defeat what they considered to be a “French conspiracy” to destabilize and re-colonize the mineral rich country, by using jihadist terrorism as a pretext for intervention. – reaction of the international community to the popularly supported Malian coup was swift and a la Iran – typical. The coup was condemned and sanctions were imposed on Mali; the Community of West African States – ECOWAS, threatened to invade to “restore democracy”. – this international pressure stymied the efforts of the Malian military to gain control of the situation in the Northern territories. The sanctions halso helped precipitate a humanitarian crisis as Malian goods could not be transported from ports in the Ivory Coast and Guinea. – the generals finally ceded to international pressure and agreed to nominate Diocounda Traore – (who has strong ties to NATO) – as interim president. It is Traore who would provide the pretext for the French intervention in a letter sent to the United Nations. – April 6, 2012 – Tuareg rebels in N. Mali declare independence; announce intention to form a democratic state in Azawad. – January 2013 – French-led military intervention begins. 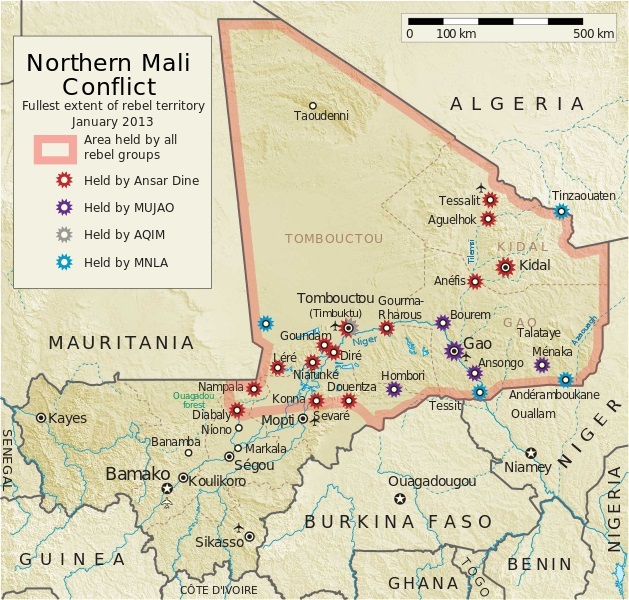 ← Mali – A Year After The French-led Military Invasion: Instability and Conflict Continue.